Recently I was talking with a friend about what to do with the Ana’s Miracle Blog. I mentioned I only posted 11 times last year and that I felt like I didn’t have as much to say as I used to. It was a question that hit me in the face like a frying pan (or maybe just a water balloon.) Internet culture dictates that a blog should go on indefinitely, but does that need to be the case? I realized that maybe it was alright to stop updating this blog. I created this blog back in 2007 to help my mother as she wrote her book Missing Mila, Fining Family. The book was publish last fall and she ended up using several of my entries. Mission accomplished! The blog was also an experiment of sharing the story online. I knew the internet was a powerful medium and I wanted to tap into it. While the blog never gain a huge following, (and thats ok!) it did connect me with a few very important people. I have come to realize that the blog wasn’t about being connected to thousands of people, but connecting with people who shared a deep interest in the story. Thanks to the blog I was reconnected with John Younger who was my very first camp counselor over 20 years ago. Over the past 15 years we has been working as a TV and Film producer. 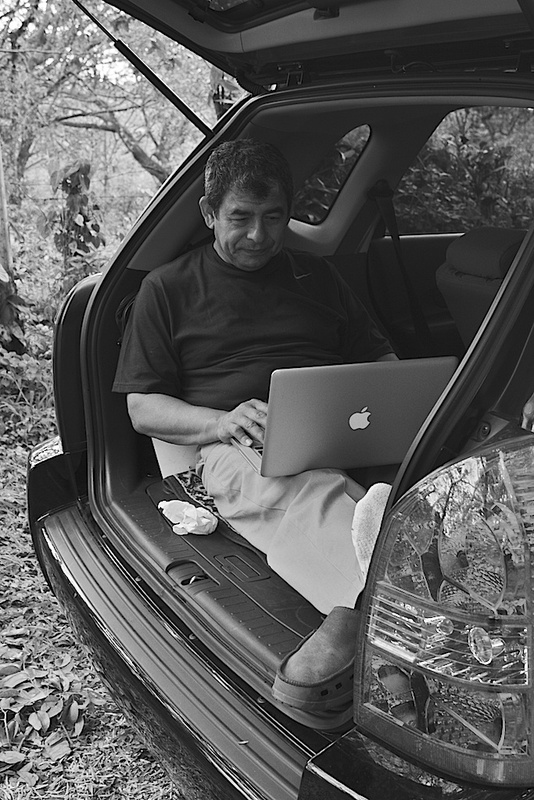 In the fall of 2010 we decided to work on a documentary film together, called Identifying Nelson/Buscando A Roberto. We are still working on the film but I have come to realize that it is the next iteration of sharing my family’s story. The reception we have gotten so far has been pretty remarkable. We have gotten some good press, several speaking engagements, and a greater interest in my mother’s book. I feel like the journey of sharing this story is, in many ways, just beginning. It’s like throwing a stone into water. It makes waves that carry on for sometime, which are invisible when you start. I am very excited to see where all the ripples take us. Internet entrepreneur Jeff Pulver often talks about the idea of digital bread crumbs. Digital content that we leave behind for people to find and learn about who we are. In that spirit I’ve decided to not to delete the blog but just to stop updating it. It is my hope that this site becomes a bread crumb that will lead people back to me, the book, and the film. I want to thank everyone who has read my words over the past couple years. Writing here has been an incredibly moving and rewarding experience. If you are just finding this site I please feel free to reach out to me and check out our other projects. Missing Mila, Finding Family: An International Adoption in the Shadow of the Salvadoran Civil War. Stuck between worlds, hoping I never have to choose. I don’t think I’ve always felt this way. When I first found out my birth name was Roberto, I wasn’t sure if I liked it. “I don’t feel like a Roberto.” I would say to myself. Over the years, as I grew closer to my family in Central America, the name grew on me as well. It even got to the point where I would secretly cringe when family in Central America called me by my American name. In this place I was Roberto. Of course, the reverse was true in the US. There I could not be anyone other than Nelson. Occasionally when I told friends my birth name was Roberto, they would proclaim that they would start calling me that. To this day no one who has met me as Nelson has been able to call me Roberto. Even my Spanish speaking friends can’t make the transition. Somewhere over the years I absorbed this other identity. I never changed who I was but I allowed this other world to become a part of me. Now, many years later, the two lives and worlds pull me in different directions. So now what to do? Now that I have these two identities and two lives what do I do with them? I feel like the world wants me to pick. I think somewhere deep down inside I am afraid that picking one of these lives means giving up the other. From time to time my birth father asks when I am going to “settle down.” When I am going to get a job that is going to give me a stable base. I hesitate to tell him that I would not see him as much. When I finished college, I worked a job that only gave me two weeks of vacation. Sure it provided security, but I sacrificed this whole other part of my life. Of course, he has his own ideas. He would love for me to live there and work in the family business. Unfortunately, staying in Panama is an equally tough decision. I’ve realized many of the activities that I love are a lot easier to come by in the US. There is also the honest truth that there are more opportunities in the US than Panama. I try to explain this to my father. I tell him how no matter where I go I’m always missing someone and the only solution I see is to always be traveling. I’m not sure if he understands. How can he? This is his world. There is no other life waiting for him in some far away land. So here I am stuck. Stuck between worlds. Stuck between lives. One foot in US the other in Central America. One day I may have to choose but I hope, with all my heart, I never have to. Honoring the disappeared in El Salvador, a turning point we are hoping to be a part of. 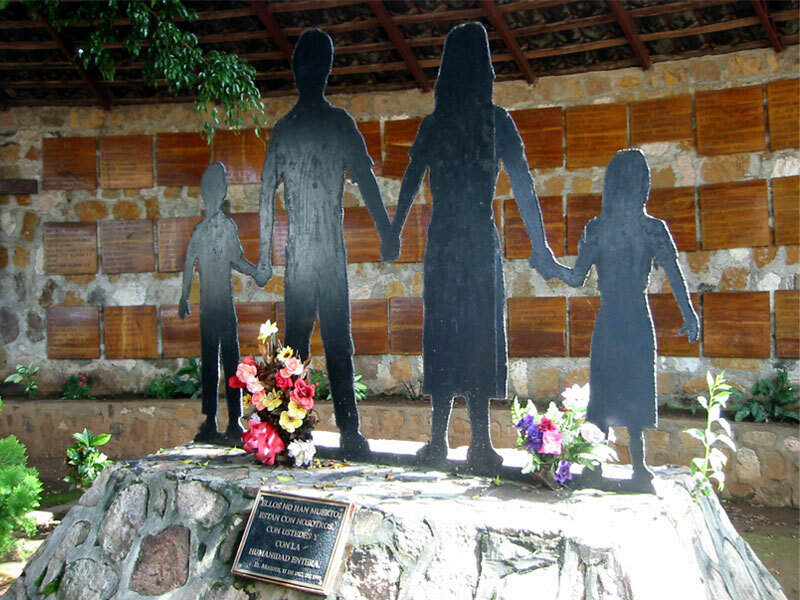 On March 29th, 2011 the Salvadoran government is planning several days of events to honor the children that were disappeared during the country’s 13 year long Civil war. These events include concerts as well as breakfast with the president of El Salvador, Mauricio Funes and his wife. Myself and six other adopted Salvadoran/Americans are hoping to attend these events. This is an important turning point in the history of El Salvador and a huge opportunity for our voices to be heard. With some help we can return to the country which, until now, denied our existence and begin to effect meaningful change. During the civil war in El Salvador many children were separated from their families. Some were forcibly taken by the military while others where lost in the chaos of war. After being taken from their families the children were then put up for adoption and sold to unknowing parents. They were adopted in El Salvador and to the rest of the world. Now adults, many of us are trying to piece together what happened during the war and how to reconcile the events of the past. Now, for the first time, the government is taking steps to recognize and promote awareness of what happened . The other week I received word from Pro-Busqueda, an organization dedicated to reuniting the family’s of the disappeared, the Salvadoran government is planning a number of events around the day of the disappeared. On March 11, 2005, the Human Rights Court ruled in the case of Serrano Cruz Sisters v. El Salvador, initiated by the girls disappearance of Ernestina and Erlinda Serrano Cruz, the first 7 years of age and the second 3 years old, which occurred in June 1982, in Chalatenango. At sentencing, the Court established, as a remedy, the obligation of the Salvadoran State to designate a day dedicated to children who disappeared during the internal armed conflict in order to sensitize society on the need for Salvadorans working together to find the best solutions that lead to the truth about the whereabouts of the children. Since then, or even before-the commemoration activities around that date have been driven solely by the victims themselves and by the Association for the search, while mostly state institutions had remained aloof from them. However, this will not be anymore. When the January 16, 2010, as part of the celebration of the eighteenth anniversary of the signing of the Peace Accords, President of the Republic, my dear husband, apologized to the child victims of conflict, took the decision to take, as appropriate, the responsibility to mark the Day of missing children in the spirit that established the Court, ie, as a remedy for victims whose end, to promote national awareness children victims of disappearance and to promote joint efforts of all sectors to find them and give them back their rights have been violated. My self and a number of other Salvadoran/American adoptees are planing a trip to El Salvador in March. We feel this is a big step for the Salvadoran government and could be a turning point for the country. Our goal is simple: to be heard. During wars, when someone is disappeared they are rarely heard from ever again. Most vanish without a trace. With these events we are being given a chance to connect with other disappeared children in a moment of solidarity. One of the events planned during that time is a breakfast with the president of El Salvador and his wife. While we aren’t exactly sure what form this will take it is an opportunity for us to speak directly with people who are actively trying to address everything that happened during our awful war. As we all know, travel can be expensive and some of us are not in a position financially to make this trip. I would hate to think that the only reason we could not participate in this historic event was money. I know times are though but I feel strongly that this is something we can get help with. Since we are going to be staying with family and friends the only real expense is going to be airfare. To get us all there I estimate that it will cost about $5,000. That’s a lot for the six of us, but there might be people out there willing to help us. I am however in somewhat of a difficult position. In the fall I asked friends and family to help finance a documentary film I wanted to create. 170 people generously gave to the project and made it a reality. So less than six months later can I really turn to them for financial help again? For me, the answer is no. Since raising money is not an option I am thinking of other ways to get the trip sponsored. I think there could be a few different ways of doing this but this is what I have come up with so far. This trip is going to be a very meaningful and emotional trip for all of us. I know that we will want to remember this trip for a long time. I would love for my fellow adoptees to have a way to record their thoughts or experience. Either for this blog or for themselves. I was thinking of looking into borrowing video or photographic cameras for the trip so they could record everything that happened. Then I realized this might be an opportunity for sponsorship. Perhaps a company/store/website that sells or rents video/still cameras would be interested in sponsoring the trip. I know companies give sample products out all the time, so how about a real world test? We could use your equipment while on the trip and give feedback about what it was like. I’m not looking for a freebie, so I’m interested in finding a way to make this work for all involved. I would personally be willing to add a sponsorship link to your company on the site. I would also be willing to provide an honest review of the product or service. I think this could be a good opportunity for a company, but then again that could just be my opinion. I’ve never tried something like this so I don’t know if anyone would be interested in this but it’s worth a shot. What’s the alternative? Not try, and miss out on a once in a lifetime event? Over the next month, I will be reaching out to different companies to talk about sponsoring the trip. If you have connections to any organization or business that might be interested in sponsoring us, please, please contact me. There is only about a month before we have to leave (March 25th) so time is of the essence. I’m also open to other ideas/suggestions about ways to raise funds. If you have any ideas about how to raise the $5,000 for the trip I would love to hear those as well. Here are a few that I came up with but I don’t know how effective they would be. Thank you so much for your support, it means so much to us. For the people the people of the revolution, Twitter changes everything. Last week we witnessed a historic event as the president of Egypt, who had been in power for 30 years, was forced out of office as a result of 17 days of protests by the Egyptian people. In some ways this revolution reminds me of the revolution that took place in El Salvador 30 years ago. Both were trying to free themselves from oppressive regimes. Both were lead by youth who were sick of the status quo and wanted change. To me there is one striking difference between the two revolutions. That is the role technology had in enabling the revolution. During the past couple weeks, people have debated about the importance of the internet to the revolution in Egypt. Some say the that the revolution could not have happened without Twitter or Facebook. Others say revolutions are about people and that is more important than what tools they use . I want to share my thoughts about the role of technology in this revolution. One of the most prominent people against the importance of “social media” during the revolution has been Malcolm Gladwell. 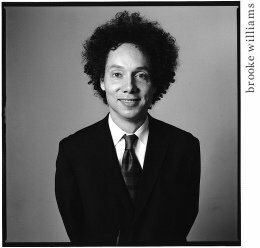 Gladwell’s main argument is that relationships on the internet are based on weak ties and revolutions are created by strong ties among people who trust each other. I think he is absolutely right about this. Sites like Facebook and Twitter do work by leveraging weak ties. For the most part these weak ties don’t amount to much because online no one cares about you. As Malcolm points out, revolutions are dangerous stuff. You do not risk your life or the life of your family for weak ties. You need a strong connection to people already in the revolution if you are going to join it. This was certainly true in my father’s case. He joined the revolution in El Salvador because of his cousin. He, in turn, brought in his then girlfriend and my soon to be mother. 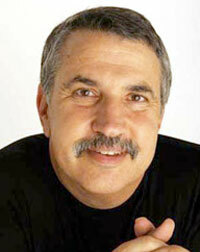 Caldwell is one of my favorite authors and a very smart man. I think he makes some really great points in his article but I also think he misses something. Technology changes the way we communicate and organize. Those changes have a very important impact on the way modern revolutions take place. To me, saying that technology does not matter is saying that those differences do not matter. This is how technology changes things and why its important. One argument against the importance of the internet in Egypt can be stated as “revolutions are about people.” Revolutions happened before the internet and it is simply a tool of the times. While this is true I think that is an easy thing to say when you are not the one being put in harms way. When the government can murder your entire family for opposing them, it changes things. It makes it so much harder to become a person of the revolution. A benefit of modern technology and all the millions of people online is a degree of anonymity. While it’s impossible to be completely anonymous when a person is one of thousands Tweeting about change, it’s a lot harder for the government to single them out. Ideas are like viruses. They spread from person to person through a society. If the virus is strong enough you get affected by it and want to bring all your friends along. Revolution is an idea virus as well. It’s an idea with a very dangerous and risky outcome. That is why you need strong ties to spread it. If you are weakly connected to someone on Facebook or Twitter the revolution virus will not spread to them, the risk is too big. However, if your ties are based on real world meaningful relationships, then social networks are like throwing gas on the fire. The idea virus spread so much faster because you can so easily see who has been infected. One of the effects of all of this technology is forced transparency. We live in a world where “secret” government cables can be published online for all to see. Where even the hottest tech company cannot hide their secrets. During the revolution in El Salvador, many American politicians condemned the revolution calling it a communist uprising. Imagine if Obama or Bush tried to call the revolution in Egypt a “terrorist uprising.” Would anyone take them seriously? In Lord of the Rings, the evil Sauron uses an eye of fire to watch over middle earth. It flits around looking for Frodo and the ring. 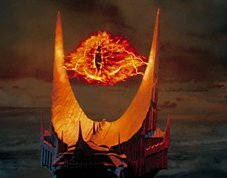 Modern media coverage is kind of like the eye of Sauron. It constantly scans the globe for the next event to focus the world’s attention on. From an earthquake in Haiti to Chilean miners there is nowhere modern media can’t take us. We were even able to pierce the earth and get video from underground as the miners were recused. When the eye of Sauron is focused on your country you better act accordingly. If the Egyptian revolution had been met with bullets instead of fire hoses the global response might have been very different. They can’t stop the signal anymore. The egyptian government had to shutdown internet service and phone services for the entire country and still they couldn’t stop the signal. After the government shutdown the internet Twitter and Google created a special number for people to call in their Tweets. One of the interesting quirks about modern technology is that there’s always a backdoor. It amazes me that given everything that was happening in Egypt we could track the status of a single imprisoned Google employee. 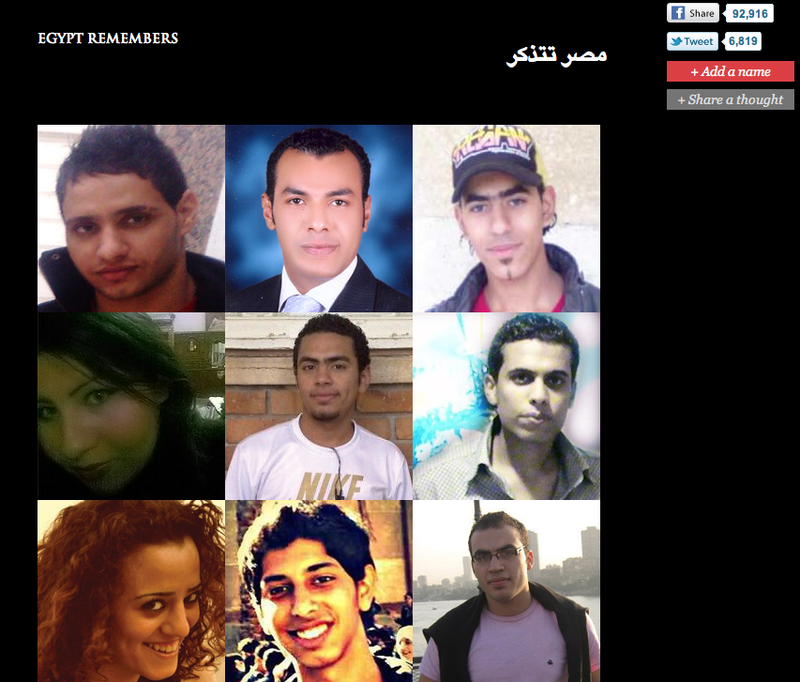 The sight 1000memories.com created a special page where Egyptians could upload names and photos of people who died during the uprising. During the Salvadoran revolution people were frequently disappeared, their voices erased from history. When someone vanished, you never knew what happened to them. There was no website for them, no news coverage, they were just gone into the blackness, with only the families of the disappeared left wondering what happened. With the explosion of cheap portable electronics everyone has a voice. You don’t need to be a reporter with fancy equipment. People in Egypt were able to take video and photos of what was happening and post them online. The images weren’t filtered and didn’t need approval. They were online for all to see and react to. One of the bloodiest incidents in the Salvadoran war was the massacre at El Mozote. Over 200 men women and children lost their lives in a brutal campaign to punish guerrilla fighters. I won’t go into the details but you can read about it here. I was surprised to learn that this event was not reported in any major newspaper until almost a month after it happened. Could you imagine a major news organization being a month late on the Egyptian revolution? In a world with 24 hour news coverage information moves fast. We can watch in real time as events unfold. I think Malcolm Gladwell is half right. Revolutions take serious action by brave individuals. The weak ties that are prevalent on social media do not constitute a revolution. What he gets wrong is that these tools have changed the way revolutions take place and that change is important. In the 1980s, many young Salvadorans organized only to be brutally crushed by an oppressive government. The war in El Salvador dragged out for 13 years, with thousands of people killed and disappeared. Even after the war ended it took almost two decades before the party of the revolutionaries gained power. By today’s standards, that kind of change is glacial. Contrast that to the revolution in Egypt which only took 17 days. I know it was a long time in the making but the revolution part lasted just over two weeks. How many lives were saved because the technology existed for their message to be heard, for the idea to spread and for people to organize effectively? So, do I think all of this technology breeds revolutions? Certainly not. Technology alone does not create a revolution, nor does it guarantee its success. Last summer we saw Iran using these same tools with a different outcome. They also do not ensure there will be no bloodshed. If a revolution takes place in Iran again it might not be as peaceful as Egypt. I understand very well that the importance of these tools can sometimes be overstated. They do not create a utopia and do not fix the world’s problems. They are just tools that make it easier to communicate and organize. If they did not exist, people would find other ways to effect change, but at what cost? The shift that technology brings may seem insignificant, but to the people who risk everything fighting for what they believe in it changes everything. Thirty years ago, when my parents started their revolution, they did not have these tools. There was no way for their voices to be heard. Their only option was to pick up arms and fight. A choice which they paid dearly for. Now anyone of us can create an idea, a website, a video that can influence millions of people and for that, the world has changed. My little sister Estefany in 1998. My little sister the other day.